Aviation Jewelry - This sensational 14k Gold Diamond Biplane Airplane Pendant is handcrafted in the USA. 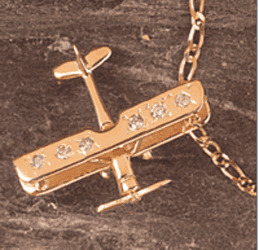 The Gold Diamond Biplane Airplane Pendant is made for the Tailwinds Collection of fine aviation jewelry, by Bernard. Bernard was apprenticed in the old world tradition by his father, a "meister" craftsman in the Vienna Goldsmith Guild. This miniature beauty exhibits great detail in the design with an open cockpit, wheels and even a propeller that turns. 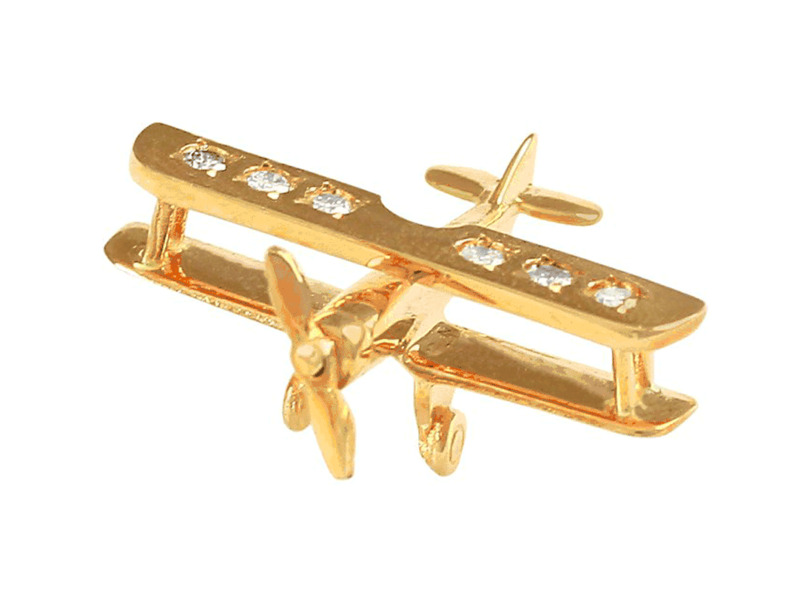 Six 2-point diamonds dramatically grace the top wing of the 14k gold biplane to make this jewelry piece really dazzle. The biplane has a wingspan of approximately 7/8".